Jenn's Journey: Dreams do come true! We closed escrow today and I got the keys!! Sadly DH is in Santa Rosa prepping for his big test tomorrow and then will be heading to SLO to watch the Griz v 'Stangs game. He probably won't see his new house until Monday. I got the keys before noon and by 4:30 we had a little gathering at the house. A cooler, some plastic cups and few friends. What else do you need to break in a house? I've been dreaming about what I would find under the carpet in the bedrooms...or better yet unable to sleep with all the amazing visions going through my mind. The living and dining rooms are hardwood, the kitchen and hall are tiled and the utility and bathrooms are linoleum. It was like Christmas morning. I'll admit I got a little teary. Look what I found!!! They are beautiful!! They need a little work but they are in great shape. 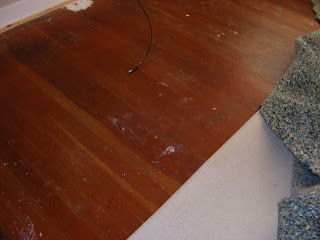 I can't wait to get the carpet completely out and get working on the floors! My project list keeps getting longer and longer. Who know when we'll actually move in. Who's wants to come visit? we would love to come visit. Chad loves the videos of him thanks for those. Missing him so much. Already booked my ticket! Yeehaw!!!!!!! !